Unlike cheap imitations, you won't want to take this apart and there are no 'stickers' to peel off or wrinkle. 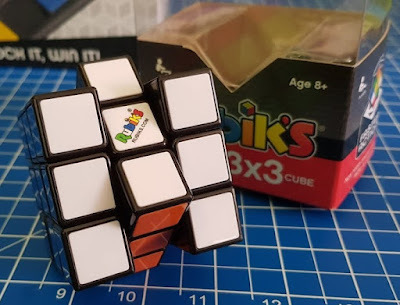 There's even a stand for you to proudly display your completed cube. 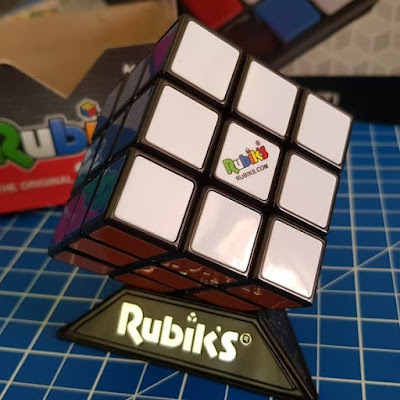 If you want an entirely black Rubik's Cube though, you can have one - you can order just about any colours, pattern or picture you like on a Rubik's Cube from the website. 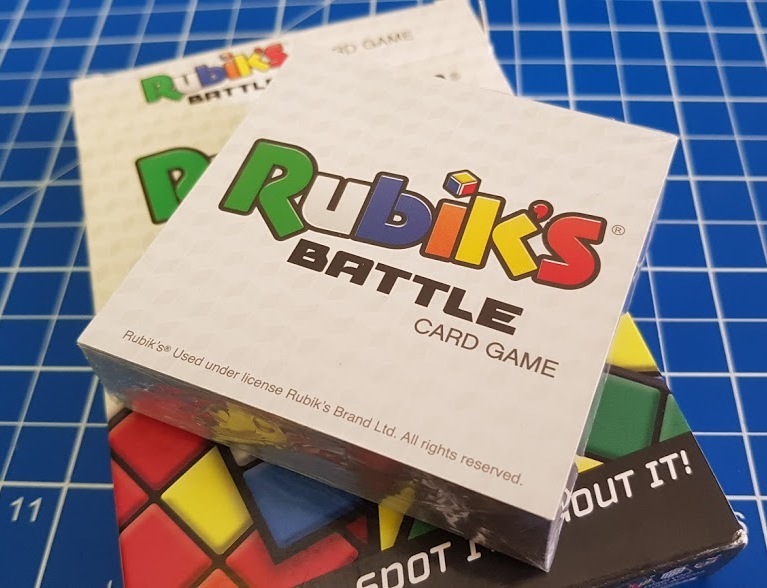 The Rubik's Battle Card Game is suitable for 2-6 players aged 7+ and contains 60 cards. 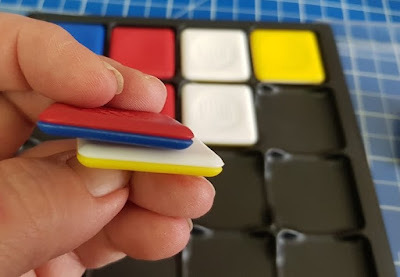 This is pretty much instant play with no complicated instructions. 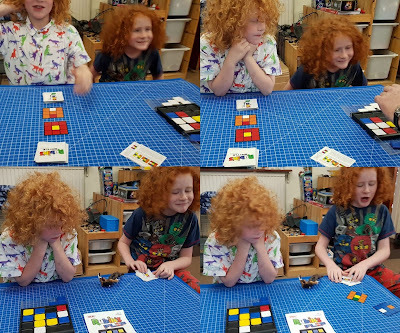 A matching game with the tagline 'show it, spot it, shout it' - which gives you a good idea of gameplay. 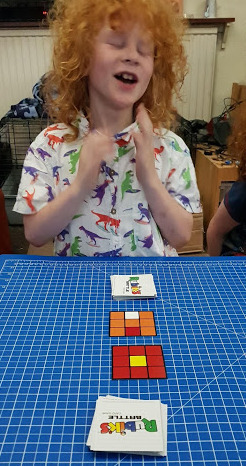 All players are dealt a share of the cards upside down, then everyone turns their top card over at once. 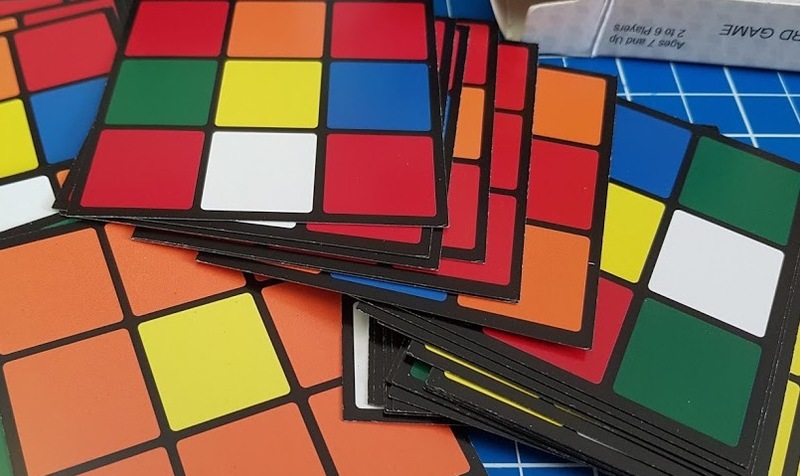 You need to spot a colour unique to yourself, either because you are the only player who has it on their card, or because you are the only player without it. As soon as you spot one, shout it out. The first person to shout correctly wins all of the cards shown. The winner is the person who holds all of the cards at the end. If you shout an incorrect answer, give everyone else a card. 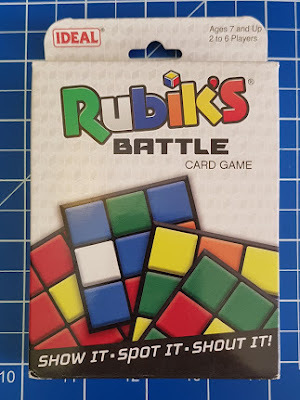 If two players turn over exactly matching cards, the first to shout "Rubik's Battle" wins all of the other person's cards. Harsh, but it adds an element of excitement and risk! 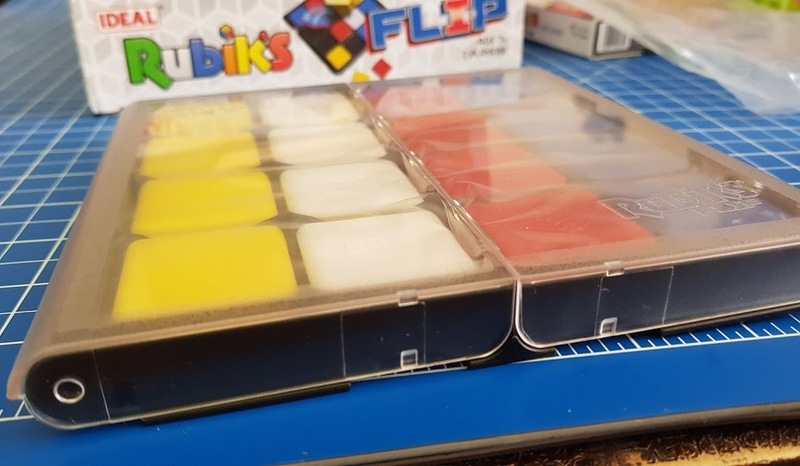 Rubik's Flip is a strategy game for 2 players aged 7+. It has hints of Connect 4 or 'noughts and crosses' (tic tac toe), but it's quite different. 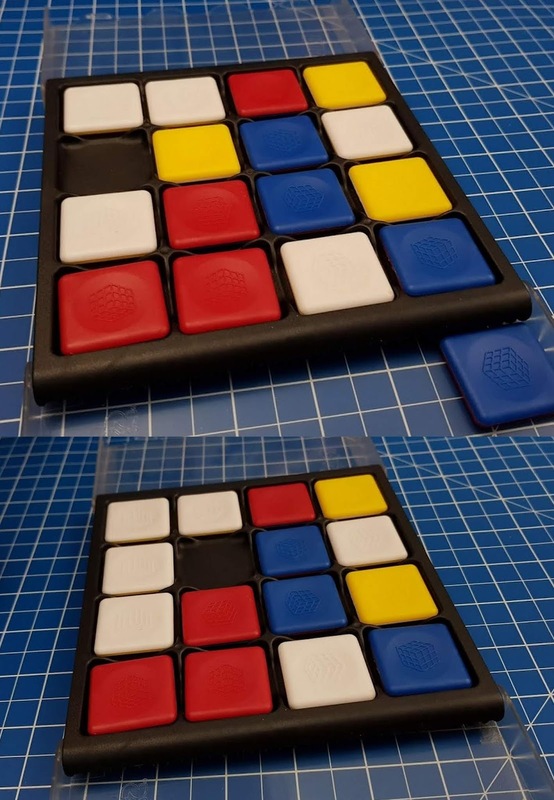 You need to use your brain for this one, and think a couple of moves ahead at all times. Easy to learn, hard to master. You start with all of your own tiles and the first player places a tile on the board. 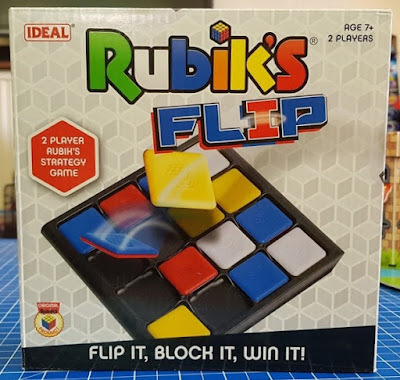 Then each player in turn flips one of their opponents tiles into an adjacent spot and then places one of their own next to it. 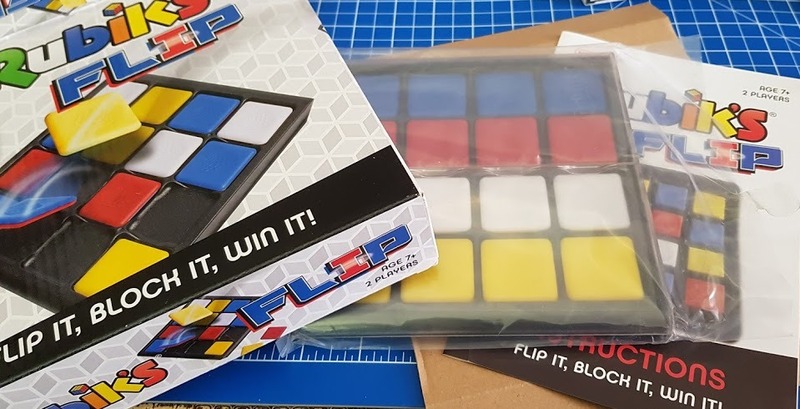 If there is no space for you to flip any of your opponent's tiles, then you can't move. The first person to make a row of 3 or more matching tiles that are locked into position is the winner. Rubik's Flip is a game that is competitive and quick, barely 5 minutes for most matches, and you need to give it your full attention. Younger players can try this one too, but they will be at a disadvantage to grown ups and older players. My 8 year old is very good at Rubik's Flip and really enjoys it - he's a mini mathematician and it suits the way his brain works. 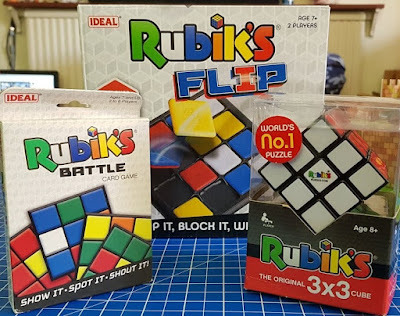 Rubik's have delighted us for the past 44 years and were an incredibly popular toy when I was at Primary School. These are simple games that are inexpensive and make great stockingfillers or smaller presents. Familiar and classic for a reason, and I think the new additions are no disappointment. Rubik's have a whole range of products and you can find out more on the Official Rubik's website, where you can also buy. Some of the range are also available from toy shops instore and online - classic Rubik's 3x3 Cube rrp £9.99, Rubik's Battle Card Game rrp £9.99, Rubik's Flip £14.99. We were sent our Rubik's Games for review.